It’s a highly contentious debate—what is the best way to secure our electronic information: a password or a biometric form of identification? Passwords can be hacked fairly easily, especially considering more than 65% of people still use simple passwords, such as “123456” or “password”. But biometrics may pose an even greater threat to security, especially if companies build large databases full of unique identifiers, such as fingerprints, which if hacked put millions of individual’s private information at risk. So, with pros and cons for each option, how will we stay secure in the future? There are several different types of biometrics. In general, a biometric is a metric related to human characteristics. Any biometric that can be measured and proves to be unique to an individual can be used as a security measure. Examples of biometrics already in use today include fingerprinting, iris scanning, voice recognition, facial recognition, and even heartbeat recognition. 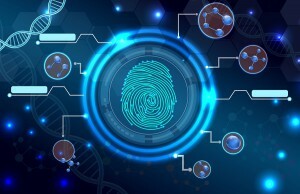 The more advanced our technologies and measurement capabilities become, the more biometric characteristics we can use as reliable unique identifiers. Why Use a Biometric Instead of a Password? Biometrics require you to store or log a copy of your biometric information for comparison. Whether this information is stored on your own device or on an institution’s database, your information is put on record somewhere, and may be used for unintended purposes. Many say this is unconstitutional. Measurement technology and implementation software is not totally reliable—it can break, malfunction, and produce errors leading to misidentification. If companies use databases to store biometric information and those databases are breached, millions of people’s personally identifiable information becomes at risk. While we can’t know for sure what the future holds, we can be sure that technology will continue to advance. If we can develop a way to securely and easily install and use biometrics as a legitimate means of security, we can expect these measures to become a common part of our everyday lives. Fingerprints and facial recognition technologies are already in use today by computers and mobile devices. It remains to be seen how and when other types of biometric identifiers will be rolled out, and if they are, if it will be for specific industries or rolled out to the masses. Whatever happens, it’s a good idea to understand the security measures available to you, and the benefits and risks of certain data and document management systems. Looking for a Better Way to Secure Your Electronic Information? We Have Solutions. Whether you use the traditional password or a more advanced form of security for your digital world, it’s important that you take proper precautions to protect your online information. Record Nations understands that as the world moves in an online direction, more of your files and information is at risk. We partner with service providers across the nation who offer the most advanced security and data backup systems on the market. If you are looking to step up your security game, call us today at (866) 385-3706 or fill out the form on the right. We will connect you to our network of contractors and get you several FREE quotes based on the services you require.